Chart of the Week: Lyft Is Finally Public — So What Happens Next? The much-anticipated day has come and gone. Lyft listed on the Nasdaq under the ticker “LYFT” on Friday, March 29, 2019 and became the first publicly-traded ride-hailing company in history. With its public debut approaching came ravenous investor demand but also doubts about the viability of the company’s business model and path to profitability. Despite lingering questions, institutional investors lined up to acquire Lyft’s shares, oversubscribing the offering by the second day of the roadshow. Lyft shares opened at $87.24, a 22% premium to its $72 IPO price and closed at $78.29, still a 9% premium. This week, though, Lyft shares largely traded sideways, closing at $68.97 today, a 4% discount to its IPO price. While the business media has been unsettled by the dip, we don’t see any reason to be concerned just yet. At the earliest, Lyft’s first meaningful test as a public company will come with its first quarterly earnings release, when Wall Street will intently examine if Lyft’s business is continuing to cut expenses as a percentage of revenue. Early investors, though, are still rejoicing, as Lyft’s IPO has brought them closer to liquidity and realized returns — private investors will have to wait for Lyft’s six-month lockup period to expire before selling their shares. At Tuesday’s market close, four early investors had stakes in excess of a billion dollars. Rakuten (Series E and G Lead Investor) held a ~$2.2 billion stake, while General Motors (Series F Lead Investor) and Fidelity (Series I Lead Investor) each had approximately $1.3 billion stakes. Lyft’s cofounders and senior management team, Logan Green and John Zimmer, had stakes valued at ~$575 million and ~$400 million, respectively. 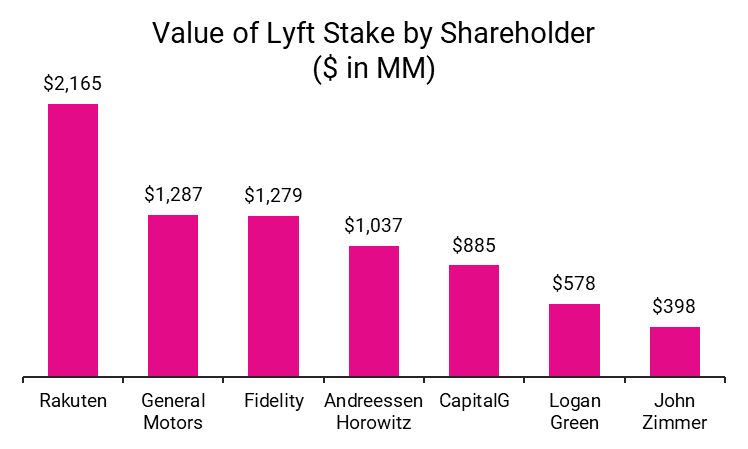 These investors, excluding the founders, are expected to generate multiples on invested capital (MOIC) between ~1.5x and ~306x if Lyft’s shares continue to trade close to its IPO price at lockup expiry, as we discussed in a previous newsletter. While investors wait for the lockup to expire, speculations concerning a Snap-like trajectory for Lyft’s stock price have continued to surface. However, it’s important to note certain stark differences between these two companies. Snap debuted on the public markets on March 2, 2017 with a $17 per share IPO price and closed at $24.48, generating a 44% pop on its first day of trading. Over time, though, Snap’s share price has fallen significantly, largely due to deteriorating user numbers and increasing losses. Unlike Lyft, Snap went public with increasing losses while Lyft has steadily decreased losses as a percentage of revenue over the last three years, indicating the company has a pulse on its bottom line. Moreover, these two companies are in different leagues when it comes to size. Lyft went public with $2.2 billion in revenue and $911 million in net losses, while Snap went public with only $404 million in revenue and even greater losses — $515 million lost in 2017. Nevertheless, Snap was rewarded with a large first-day price pop while Lyft has fallen in its first couple days of trading. As such, we think the comparison to Snap is a bit unfair at this point. More Funding for The New Crop of Unicorns? : Lyft’s IPO will potentially bring substantial returns to its private investors, and as the chart above illustrates, billions of capital may return to them. Additionally, Lyft’s early employees are also receiving considerable windfalls, creating a new class of millionaires. As a result, many VC firms and insiders will have dry powder to invest in the next crop of startups as they chase the Lyfts of the future. The Flood Gates Open For IPOs? : More startups may follow in Lyft’s footsteps and pursue public offerings. Lyft’s IPO was a test case for highly-valued and relatively mature startups eyeing the public markets. The ride-hail company’s debut reinforced that institutional investors have an appetite for high growth companies even with large losses and no clear path to profitability. If Lyft’s stock price continues to fall, however, its IPO will of course have the opposite effect and we may see companies staying private even longer. Will The Buying Spree Begin? : As private companies, startups are forced to primarily use cash to acquire targets, as their private shares are illiquid. Cash of course is crucial for high-growth, highly unprofitable companies, and acquisitions can be expensive. As public companies, Lyft’s peers would have a viable, alternative acquisition currency in their publicly-traded shares. As a result, we may see more large, fast-growing tech companies competing with the incumbents for acquisition targets. If you're interested in Lyft's IPO, check out our Lyft IPO Center to learn more!